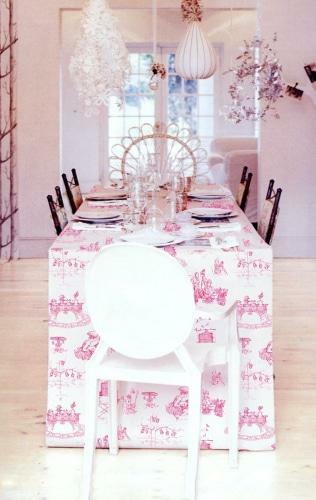 I adore Toile‘s. They are so intricate and beautiful. 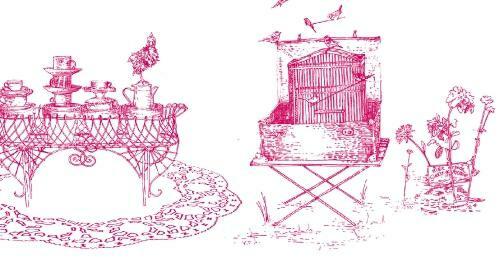 I have done a range of South African inspired Toile’s for Carol Mills Fabrics which I will show you one day but today I thought I would show you the first one I did and one which I still hope I can find a purpose for one day. Inspiration came from South African things: The doilie (drawn as a floor mat)Â underneath the wrought-iron table with a chicken sitting on top of the plates and cups; my next door neighborus who are actors and actress’s with their dog ‘Didi’, an old wagon wheel, a bird cage inside a suitcase with Mossies on and there is even a garden knome that you find in so many old South African gardens. I also super-imposed using photo shop the design into a setting to show an example of how it could be used (below). The design is a little rough on the edges and not as refined as traditional Toile du Jouy’s but perhaps that is not a bad thing. I am still trying to ‘hear’ what this design wants or needs to feel finished. Any ideas? 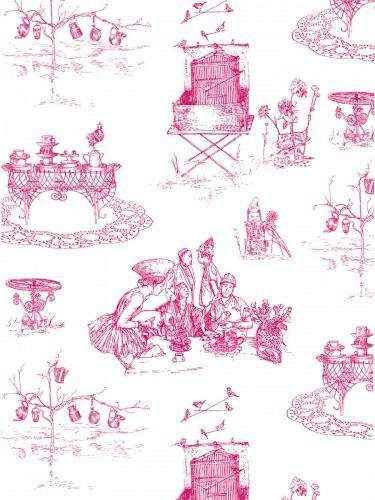 This entry was posted in Blog and tagged Carol Mills Fabrics, Drawings, Fabric Design, South Africa, Toile, Toile du Jouy. I really could see it as an oil cloth! It would make a great table cloth for a round table out on a porch or something. If I had that print, I’d like it in a oil cloth to make magazine totes and lunch totes. Or as a canvas to make place mats. Or a thick cotton to make napkins. Really nice design!Looks very beautiful!Have a nice weekend! Anne is now on the way… :O))! Happy new year to you! Would love to see the South African version. I love the slight roughness to your South African toile. Actually I would love to find out how to get this fabric. I am expecting a baby next March and would love to have the nursery drapes in this fabric. Good day, I am in love with your fabric, and woulod love to stock it, please can you advise the cost……thanks a mil! Thanks so much for the inquiry Heather. This design never got as far as printing. Since re-desiging it I have thought about printing a few meters just to see how it looks but I have not gone ahead with it as of yet. If I do, I will let you know.